The boom town of Skagway, Alaska at the time of the Yukon Gold Rush. Reading The Floor of Heaven: A True Tale of the Last Frontier and the Yukon Gold Rush by Howard Blum has given me a renewed respect for the HBO’s Deadwood. The Floor of Heaven is a history of the gold rush as seen through the eyes of three men who were there, two of them to get rich, although only one of those two by digging for gold, and one to put in jail men like the other man who got rich by stealing from the men who did the digging. That third man was Charlie Siringo, a Pinkerton agent, who became famous as “The Cowboy Detective,” although very little of his detective work over a long and successful career as a lawman involved any cowboying. The man who got rich by digging for gold was George Carmack, whose strike at Bonanza Creek set off the stampede to the Klondike. The man who got rich by stealing was Jeff “Soapy” Smith, a gambler, con artist, violent thug, gang leader and criminal mastermind with ambitions to make himself a respectable citizen. I’d call Smith a real-life Al Swearengen, except that Al Swearengen was a real-life Al Swearengen. Quick summary: In the mid-1890s, the three men head north to Alaska. Siringo, who has a gift for undercover work, is out to solve the mysterious robbery at a gold mine. Carmack, whose lifelong ambition is to find the pot of gold at the end of the rainbow his father wasted his life chasing, sets out as a prospector but comes close to settling for a life as an Indian chief. And Smith, on the run from the law, sees in Alaska’s wide-open and virturally unpoliced frontier all kinds of opportunities for a man of his particular talents to make easy money. Eventually, the trio’s separate paths to adventure intersect, with guns drawn on all sides. The Floor of Heaven is, as advertised above, a rip-roaring tale of high adventure featuring cowboys, Indians, outlaws, robbery, murder, and million dollar gold strikes told with verve, humor, and charm by Blum, a contributing editor for Vanity Fair, a former New York Times reporter twice nominated for a Pulitzer Prize, and the author of other true tales of adventure and mystery, including the Edgar Award winning American Lightning: Terror, Mystery, and the Birth of Hollywood and The Brigade: An Epic Story of Vengeance, Salvation, and WWII . The hero of The Floor of Heaven is Charlie Siringo. This is partly due to the fact that Siringo was a heroic character. But it’s also due to his having made a second career for himself as a writer of rip-roaring tales of high adventure that happened to be true and featured himself as the main character. All three men, Siringo, Carmack, and Smith left copious written records of their lives, but Siringo wasn’t only the more talented writer, he was the more interesting human being, as well as the most decent. All three were intelligent, brave, and energetic, but Carmack and Smith were both emotional drifters; on the one hand they were ambitious, on the other they didn’t care. They weren’t so much driven as pulled forward by their dreams, and when you get right down to it, their dreams, although grand in scale, were fairly trite and dull. They wanted to get rich and without having to work hard to do it. Carmack did work hard, and it’s actually amazing how hard and how much he put himself through physically, but he didn’t expect to have to work hard for long. Any day now, he was going to find the mother lode and then he’d be done with it. Smith kept himself busy with schemes to get rich without doing any honest work, but while some criminals are fascinating in their criminality, Smith’s mind seems to have been mostly elsewhere. He and Carmack lived in their dreams, so when Blum has to bring one or the other of them front and center in his narrative and we are made to see things happening from their points of view, there’s a certain fading of focus, a lack of clarity and immediacy. Carmack and Smith just weren’t paying close enough attention. Siringo, however, was all attention. He wouldn’t have survived as an undercover detective otherwise. He didn’t just see everything clearly, he took it all in, in detail, and if he couldn’t see its immediate importance, he filed it away as potentially useful. The result is that he’s given Blum more to work with when the point of view shifts to Siringo’s. But it’s also the case that he was a good-natured, outward-looking, and open-hearted human being. He liked people, even the ones he was out to put in jail, and he was interested in what made them tick. These are qualities that helped make him a good detective, but they also made him a livelier and more entertaining writer. Plus, he led an adventurous and exciting life. So it’s not surprising that things perk up mightily whenever Siringo takes over the story. We meet him as a young cowboy, top hand on a cattle drive that has just rolled into Dodge and getting into a bar fight, that he loses, with the sometime lawman, sometime gambler Bat Masterson, Wyatt Earp’s friend and first boss. We follow him into the company of Pat Garrett and a target-shooting contest with Billy the Kid and from that adventure he and we move on to his courtship of the beautiful, dark-eyed Mamie Lloyd and his decision as a married man and new father to settle down and leave off riding the range for steady work as a small businessman. He opens a cigar shop, that does well, an ice cream and oyster parlor, that does better, but he starts to grow restless. Siringo was ambitious too, but not for money. He wanted work that made the most of his talents and brains. He was a successful shopkeeper but the work didn’t engage his full attention or need all his considerable energy. He talked his way into a job with the Pinkerton Detective Agency, helped clean out their corrupted and incompetent Denver office, and took on his first undercover assignment, infiltrating a gang of outlaws in order to track down a murderer. Then Mamie suddenly got sick and died and Siringo went into an emotional tailspin that he attempted to pull himself out of by taking an assignment in the far north. He went undercover again to solve a series of robberies at a gold mine and it was while working this case that he first met up with George Carmack, whom he initially suspected of being in on the robberies. But he figures out who the real robbers are, realizes they’ve already hightailed it, and sets out in pursuit, which requires him to become not so much a cowboy detective as a sailor detective. He searches for the thieves up and down the coast of the Alaskan panhandle, plying the waters in an overloaded and less than seaworthy canoe. Along the way he shoots it out with a whale. Eventually, he crosses paths again with Carmack and with Soapy Smith. Blum has chosen to tell his story in the limited third person. When the action shifts from one of the main characters to another, the point of view shifts too and we see things strictly through that character’s eyes. Although he had plenty of other sources, his main sources were his three main characters and it appears that long stretches of his narrative are rewritings, paraphrases, and summaries of their writings. It’s hard to say how good a writer Siringo was because Blum rarely quotes directly from his, or either of the other’s, writing, but it’s clear he knew how to structure a story and if he wasn’t a particularly introspective man he was a sharply observant one. He understood that people told you a lot about themselves by gesture and habit as well as by word and, since he defined himself to himself by what he did more than by what he thought and felt and then redefined himself by writing about what he did, we get a pretty good sense of him as a person and of the people he dealt with. I suspect that his impressions of George Carmack are more reliable than Carmack’s own impressions of himself. But then Carmack seems to have been careful not to have formed any definitive impressions of himself. Carmack left behind a voluminous personal correspondence and an autobiography (that went unpublished in his lifetime), but he had a habit of sentimentalizing, romanticizing, and idealizing his feelings. He wasn’t just ambitious to be rich. He dreamed of being a certain kind of rich and successful man, and in the letters he wrote as a young man he took pains to present himself as if he was steadily on his way to becoming that sort of man and---although, again, I can’t be sure because as I said Blum rarely gives us direct quotes---if in his autobiography he was more honest about what sort of young man he’d actually been, naive, often foolish, floundering, lost in his own dreams, he was still prone to romanticize and sentimentalize his adventures. In short, Carmack doesn’t come across as the most reliable source on the subject of George Carmack. And since he was something of a loner and inclined to keep an emotional distance between himself and other people---possibly because he was afraid that they're versions of reality would impinge on his dreams---he doesn’t come across as the most reliable source on the subject of the people he dealt with either, even those he most cared about. Consequently, when other characters enter his sections of the story, they tend towards caricature and Carmack’s interactions with them play like the melodramas that were popular on the music hall stages of the period and that would soon provide the plots of countless silent movies and then talkies and then TV westerns, which is ironic since it was Siringo who wound up in Hollywood and whose exploits provided the plots for countless movies. I have to point out that this isn’t actually a flaw in The Floor of Heaven. In fact, it’s part of its charm. It’s a reminder of how the reality of the Wild West, of which Alaska was the last frontier, blended with the legend and that the truth could be more outrageous and exciting than the fiction. Plus, in a roundabout way it gives us insight into Carmack as a character that Carmack couldn’t relate honestly and directly about himself. And, despite his self-romanticizing dreaminess, Carmack was smart and practical and perceptive in his way. He knew what he was doing when it came to prospecting. He could hunt and he could fish and he could use an ax and a saw. Blum relies on him to tell us how things got done on the Alaskan frontier and to show us what the place was like---big, beautiful, empty---how the land lay---not flat---how the weather was---generally cold---and how the people lived. Through him his eyes Blum shows us how to survive an Alaskan winter, how to build a snug cabin, how to catch a salmon, how a few men went about digging out a million dollar mine. In one of the book’s most thrilling sequences, we follow Carmack up the dangerous mountain pass that was the most direct route into Yukon from the American side and which over time as the rush sent thousands up the trail became lined with the bones and rotting carcasses of overworked pack animals and every step of the way marked a spot where someone who had tried the ascent ahead of you had collapsed in exhaustion, pain, or despair. And if his life wasn’t as full of incident as Siringo’s, he had his share of adventures. He started out in life as practically an indentured servant to his brother in law, tending sheep in the mountains of California. During the long, lonely hours he consoled himself by composing bad poetry and dreaming of gold. He joined the Marines to get away and the Marines sent him to Alaska. Up there he determined that Alaska was where he was going to strike it rich, and as I said, although he was a dreamer and prone to losing himself inside his dreams, he was also practical and smart. He decided that before he’d go stampeding out into the wilderness hunting for gold he’d learn how to survive out there first and he picked as his teachers the people that knew the place best, the Indians. He ingratiated himself with the Tlingits who lived around his Marine camp and got to know them and their ways so well that he was more comfortable among them than among his fellow white men. Later, on his second go-round in Alaska, after having deserted from the Marines, when his luck was running so bad that he temporarily gave up his dreams of finding gold, he lived with other Indians, a tribe of Tagish, who adopted him as one of their own. He took and Indian wife, they had a child, he went on a vision quest (and had an actual vision), and tried to satisfy himself with ambitions of becoming a chief of the tribe. Then one day his old dreams of gold returned. He picked up his shovel and ax and pan again and set out. Led by his instincts and trusting his knowledge gained from past experience, he wandered up a tributary of the Klondike River, dipped his pan in the running water, and came up with something shiny and yellow. He named the creek Bonanza Creek and set to work. It wasn’t long before he knew he had found it, the true mother lode. Word got out, thousands headed for the Klondike, the gold rush was on, but Carmack was already a rich man and growing richer with each shovelful of dirt he dug. That’s when he caught the attention of Soapy Smith. Smith had come to Alaska because the once Wild West of the lower forty-eight had finally become to civilized to tolerate his presence. He had run out of places to run to when too much law and order made it impossible for him to do business anymore. He was an organizational genius, though, and in each new town where he’d set up shop, he’d quickly assemble a gang of thieves and thugs with a variety of criminal skills and talents, buy himself political influence, pocket a lawman or two or three, open up a saloon and a whorehouse, take control of a large share of the local gambling, and soon be at work fleecing all and sundry. He repeated the pattern twice in Alaska and he was pretty much running the town of Skagway when George Carmack struck it lucky. You can see what I mean about Smith being a real-life version of Deadwood’s Al Swearengen, and for all I know he really was like the character so brilliantly played by Ian McShane. Smith must have been possessed of a dark intelligence and he was a dangerous man, capable of terrible violence when angered. But it’s hard to say from Floor of Heaven what he was really like, which isn’t a failure of talent as a writer on Blum’s part but the result of a structural weakness in the organization of the story and Blum’s chosing to tell his tale in the limited third person. Siringo and Carmack wrote enough and wrote well-enough to give Blum plenty of material to develop their points of view. Smith didn’t write an autobiography. He wrote many letters to his wife whom he kept out of the way back in Kansas, but there was a lot about himself and his life out west and up north he couldn’t tell her, partly out of fear that a letter might go astray and wound up in the hands of the law, but partly out of a game of pretend he and his wife were playing with each other. Smith apparently dreamed of the day when he’d have earned enough money from his criminal enterprises that he could afford to go completely legit. He longed to be a respectable and upstanding citizen and he and his wife often wrote to each other as if that day had already arrived. The Jeff Smith who appears in many of the letters, then, is a fabrication and a rather banal and dull character to boot. But what’s really disappointing about this phony is that he doesn’t know any of the details of Soapy Smith’s crimes and depredations and he wasn’t intimately acquainted with members of Soapy’s gang, which is too bad because it would have been interesting to have a peek into the individual personalities of men with names like Slim-Jim Foster, Old Man Tripp, the Moonfaced Kid, Fatty Green, Kid Jimmy Fresh, Yank Fewclothes, and Yeah Mow Hopkins. Smith routinely made the papers, but the journalism of the times favored sensationalism over insight and facts were what reporters and editors needed them to be to fit their stories, if you can imagine that. A character named Soapy Smith would make headlines, but neither journalists nor their readers cared how how closely that character resembled the real person it was based on. The things he did were thrilling in that they stoked readers’ fears or inflamed their imaginations. Why he did what he did was easy enough to explain. He was a villain and a scoundrel. What else did you need to know? While Siringo’s and Carmack’s adventures would make a good movie or movies---and Floor of Heaven has been optioned by Fox 2000---the parts of the book focusing on Smith seem to be straight out of the movies, background and set up to Dodge City or Destry Rides Again, and rather than coming across as the main player in his own story, Smith often seems at a loss, going through the motions, while waiting for Errol Flynn or Jimmy Stewart to stride onto the scene and kick start the plot into motion. Unfortunately, since this is history not the movies, the hero doesn’t appear to confront the villain until the final act. But it’s not just with Smith that Blum’s narrative strategy causes a problem. As I said, Carmack, while observant and perceptive, was not particularly insightful, but Siringo, despite his talents as an observer and reporter of his own life, isn’t necessarily always reliable. Smith, of course, couldn’t sign his own name without working a lie into it. But Siringo wasn’t under any compunction to be a hundred percent truthful. He was writing for an audience that wanted rip-roaring tales of adventure not introspective memoirs and they appreciated writers who didn’t let the facts get in the way of a good story. There’s reason to wonder if from time to time Siringo gave into the temptation to embellish, so it might have been helpful if Blum hadn’t been so wedded to the limited third person and allowed himself to break away now and again to quote outside sources that could have told us things Siringo and the others couldn’t have known or supported some of their more astonishing adventures. There’s another problem in that I don’t know whom to blame when Blum’s writing starts to take on the flavor of the dime novels of the period. I suspect that while he was trying to convey the sense of Siringo’s character as Siringo portrayed it himself Blum allowed himself to be infected by Siringo’s prose style. Since Siringo was working within the conventions of the bestsellers of the day, he probably felt he had to make himself sound like what his readers thought a real cowboy sounded like. The result is occasional eruptions of corniness that the writers of Gunsmoke would have been embarrassed to work into dialog for Festus. People don’t think or feel or believe they have to do something as often as they are “of a mind” to do it. They rarely guess, figure, conclude, decide, deduce, or reflect. They “reckon”. Siringo doesn’t reach for his gun or his pistol or his revolver or his weapon; it’s always his “Big Colt.” Blum grows way too fond of this locution to the point that he might just as well have started calling the gun “Ol’ Betsy.” In the course of just a few pages we read that someone has no “hankering” for gold and someone else wants no “truck” with Indians. There’s “plumb foolishness” all about, folks who fall into conversation get to “jawing,” things cost “a pretty penny,” and fifty bars of gold weigh “near on” three hundred pounds. You can’t help feeling that a durn tootin’ is going to “roll into town” any minute. It never does, although durn makes its way onto a page by its lonesome and we are bushwacked by a tarnation. I kept wishing for signs that along with all his other research Blum had read the works of two great writers from the period who happened to be in Alaska around the time as Carmack and Siringo and Smith and chronicled their own adventures, one in his fiction and one as a continuation of his nature writing, Jack London and John Muir. He also might have benefited from watching episodes of Deadwood. All the wild and prodigious and wonderfully creative cursing on the show was there to disguise the fact that the characters all spoke their own unique and lyrical versions of great Nineteenth Century prose and poetry, proving week in and week out they were the contemporaries of Mark Twain, Walt Whitman, Emily Dickinson, Stephen Crane, and Henry James, whose works they might have read along with if not instead of the novels of Ned Buntline. For a flavor of how people in the second half of the 19th Century actually thought and wrote, it would be better just to strip the c-words out of any of Al Swearengen’s speeches. None of this amounts to a fatal flaw nor should it or will it get in the way of an overall enjoyment of the book. It’s just a reminder of how rich and varied the literary history---fiction and non-fiction---of the West is. Anyway, if I want to read John Muir or Jack London, I can read John Muir and Jack London. As a matter of fact, I did. I had a lot of fun reading Klondike Tales and Travels in Alaska alongside The Floor of Heaven. Blum’s book is a welcome addition to that section of my bookshelf. A rip-roaring tale of high adventure that happens to be true and highly entertaining as well. 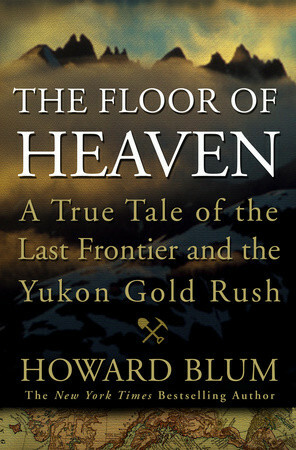 The Floor of Heaven: A True Tale of the Last Frontier and the Yukon Gold Rush by Howard Blum, published by Crown Publishers, is available in hardback from Amazon and, yes, boys and girls, you can get it for your kindle. Excerpt. George Carmack climbs the Chilkoot Trail. In the early morning, he woke up stiff and aching. He came out of his ten, his boots crunching against the fresh layer of of ground frost, and for the first time he had a good look at the mountain he intended to climb that day. The camp lay in a broad basin, and from this perspective the Chilkoot stood out from the surrounding peaks. It seemed to rise higher and more steeply, and the sunlight glinted with harsh menace off the green-iced glaciers that fortified its walls. It would be impossible to cross, George suddenly moaned to himself. He’d barely taken a single step, but the muscles in his thighs and calves were still throbbing from yesterday’s ordeal. Yet how could he dare to give up, to turn around and go back? But would that be any less of an embarrassment than surrendering half-way up the mountain? Or, worse, falling to his death, his body lost forever, shrouded each passing year by snow and more snow? Then George saw the Indians hoisting their huge sacks---one hundred pounds each!---onto their backs. And they Day brothers, too, had lit their cob pipes and were raring to head off. George knew he could not be the only one to quit. He was, he chastised himself, too close to his lifelong goal to give up. So in a tremendous burst of will, he lifted his pack to his back, adjusted the leather shoulder straps, and joined the others. It was four miles uphill to the summit, and George had not gotten far before it became clear to him that he was locked in a battle to the death: Either he would cross the Chilkoot into the Canadian Yukon or he’d die trying. Even if he didn’t have the heart, it was no longer possible to turn back. The snow was thick underfoot. Icy boulders as big as street cars needed to be traversed. The wind shrieked. A mammoth overhanging glacier reflected the sunlight like a prism, dazzling hues of turquoise, sapphire, and rose bouncing off walls of sheer ice, blinding him, while the huge glacier itself seemed poised to come crashing down at any moment. He sweated under his heavy coat. His socks dripped rivulets of ice. His pack ground down hard on his back as if he were carrying the broad trunk of one of the sturdy evergreens he’d only days before admired. After two miles, the line of bone-weary men reached a flat-ledged slope. The Indians lowered the packs from their backs. It was a signal to rest. George could now see the pass’s white-tipped summit. It was tantalizingly close. Nevertheless, he decided he could walk no father. Photo of Skagway courtesy of the Virtual Museum of Canada. Photo of Jefferson Smith and his gang courtesy of the Alaska State Library. Photo of miners on the Chilkoot Trail via the National Park Service. It is just so darned easy to buy a book for Kindle, which is what you just talked me into doing.... I'm looking forward to reading this. Charlie Siringo himself, or as the publishers would have it, Charles Siringo, is available for kindle as well. Inexpensively, even.